This one was in the category of “fantastic, yet coulda happened,” you know the kind. This dream seemed so real that when I woke up I was going to ask my husband, Jeff, if he had gotten a program at the wedding we had attended. I was so hoping that he had brought one home with us. I remembered that I unfortunately left mine in the beautiful red folder that we were handed. I’ve never seen such an elegant folder at a wedding. It was a hardback cover holding the wedding program and a detailed map of how to get to the reception, etc. The important thing was the wedding party, the list of attendants and honored guests. Of course, first on the list were the two terrific people we came to see get married. Next up, well to me anyway, were the names of the performers at the wedding reception. None other than Ann and Nancy Wilson and, their friend, Sue Ennis. Keep in mind, I did say this was a “fantastic, yet coulda happened” dream. I could not believe my own eyes. A sighting. A real, up close sighting. I so wanted to hop out and meet them, yet, I don’t know why I did not. I seemed to have been frozen to the car seat. May be that I had figured that screaming had accosted them enough. Besides, at this point I’d be lucky to say anything intelligent. I would have told them that they were my idols and I was one of their biggest fans…. someone who had followed their musical career since 1974. Someone who had listened to and lived their music for all this time. Someone who even fashioned a coat for herself that was similar to one that Ann wore onstage. Someone who had found Mushroom Records while on a vacation to Vancouver, B.C., just because Heart had been there. Then, to my amazement, these women with the magical voices and beautiful music were going to perform at the wedding reception. Upon awakening, I don’t really remember much of the wedding, except that it was beautiful with love all around. Nor do I remember the wedding reception and seeing and hearing the much-anticipated performance of Ann, Nancy and Sue. You’d think my dream would have allowed that. After all, I did SEE and HEAR them at the gas station!!!! Dreams like this appear to me every so often. This one reminds me of how much I’ve enjoyed their music over the years and how much Mom knew I enjoyed their music. She knew of all the performers I enjoyed. She was such a good mom that she’d tape concerts and appearances from the television and give them to me to watch as often as I wanted. She’d listened to their music with me. These dreams keep Mom close to me. 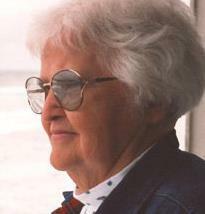 Her influence in my life is so vivid much like the dreams she appears in and the ones she conjures up for me. Let me rephrase that….. OUR Reception shoes. 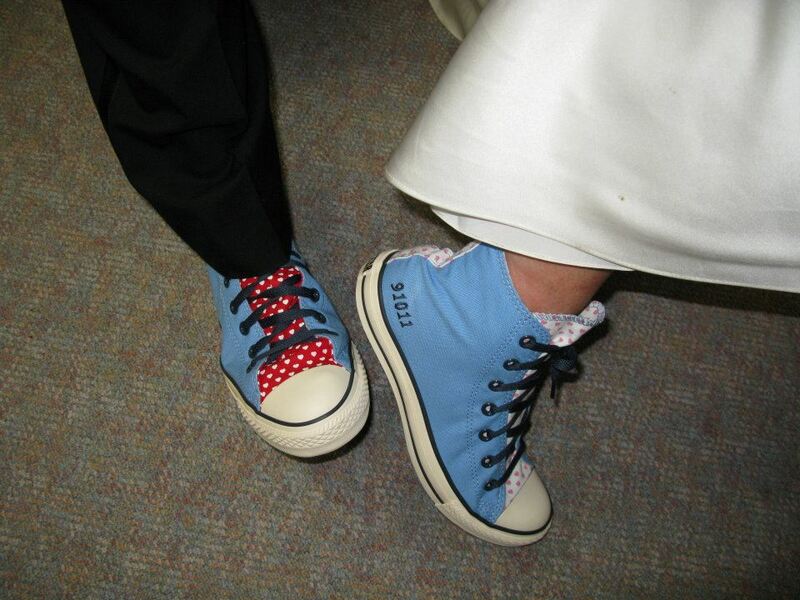 OUR ‘Converse All-Star Chuck Taylor Specially Designed’ Wedding Reception Shoes. During our wedding we would wear borrowed and rented shoes. The elegant and the dapper shoes. So, we did. We went to the Converse.com site and designed our own shoes, OUR ‘Converse All-Star Chuck Taylor Specially Designed’ Wedding Reception Shoes online. We designed them, placed the order and then waited for them to arrive. 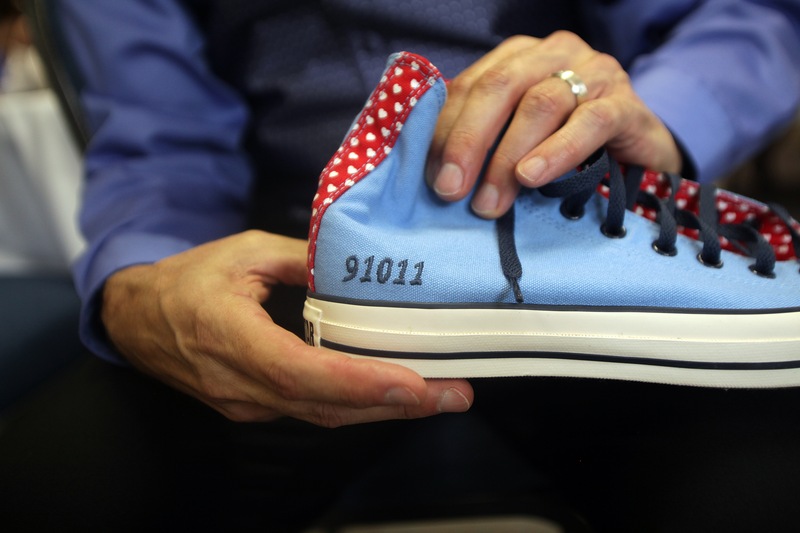 Jeff and I saved “OUR ‘Converse All-Star Chuck Taylor Specially Designed’ Wedding Reception Shoes,” for a special reveal at our reception. Our guests saw the fun we had wearing and showing off OUR wedding shoes. We had a great time thinking up the concept, thinking ahead to the day we’d wear them. My soon-t0-be husband and I had a great time designing the shoes online, thinking of our wedding reception and the reaction of our guests when they would see our shoes. Mom would have loved the entire escapade. It was such a fun idea – and let me tell you – she would have encouraged the fun and creativity. She would have loved our shoes. I certainly did not remember seeing them before. Yet, I KNEW what they were. 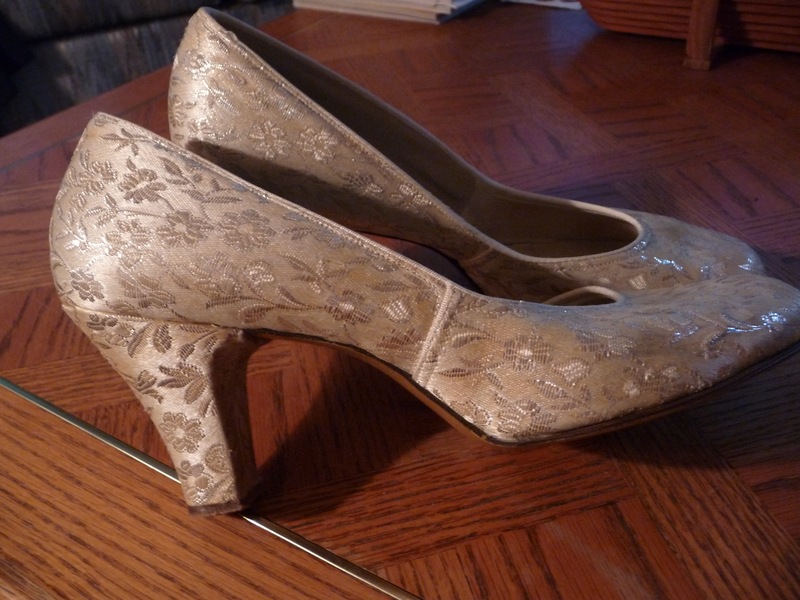 No matter if I never had the chance to use them, I was not going to give away the shoes Mom wore during her wedding. I saved the shoes. I stored them away at my house. Some day, some one would be lucky enough to have the pleasure of using them. Seasons passed. Mom’s wedding shoes were still safe in my closet. In October of 2008, I met Jeff. We seemed to have a lot in common and yet enough differences to make things interesting. We established a friendship that became a wonderful relationship. Soon I realized I had fallen in love with Jeff. And, Jeff felt the same about me. February 14, 2010 we became engaged. I KNEW what shoes I’d be wearing sooner than some day. 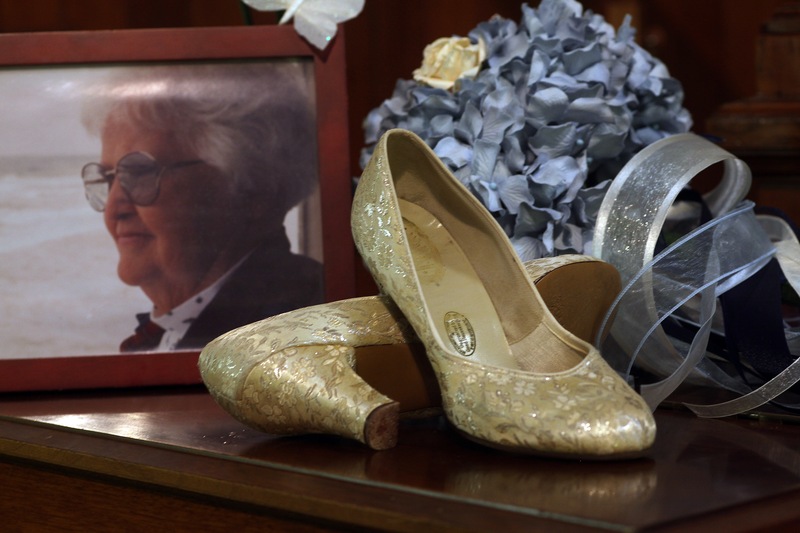 Mom’s photo, Mom’s wedding shoes, my wedding bouquet….photo taken shortly before my wedding to Jeff on 9.10.11. Notice the “Good Housekeeping Seal of Approval” in the arch of that shoe. 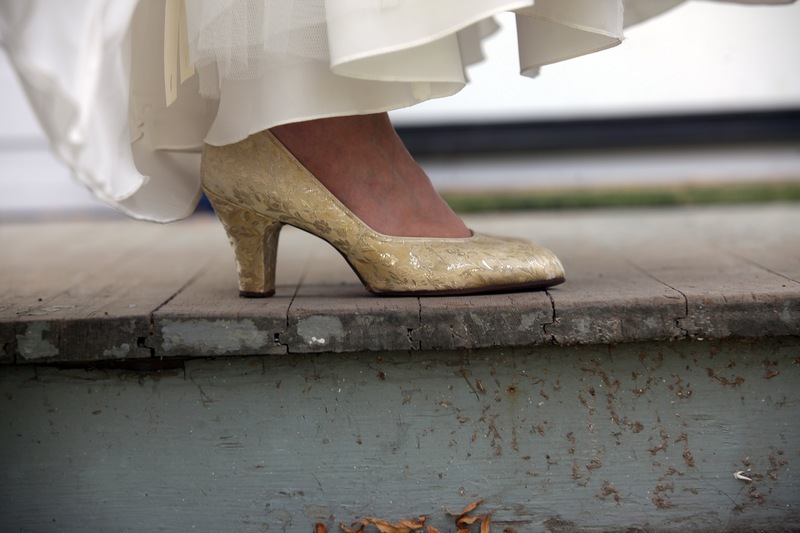 I wore my Mom’s wedding shoes, the ones she wore in 1956 when she walked down the aisle to marry Dad. I was honored to have Mom walk with me at my wedding, as well as walking with Dad. I love them both. 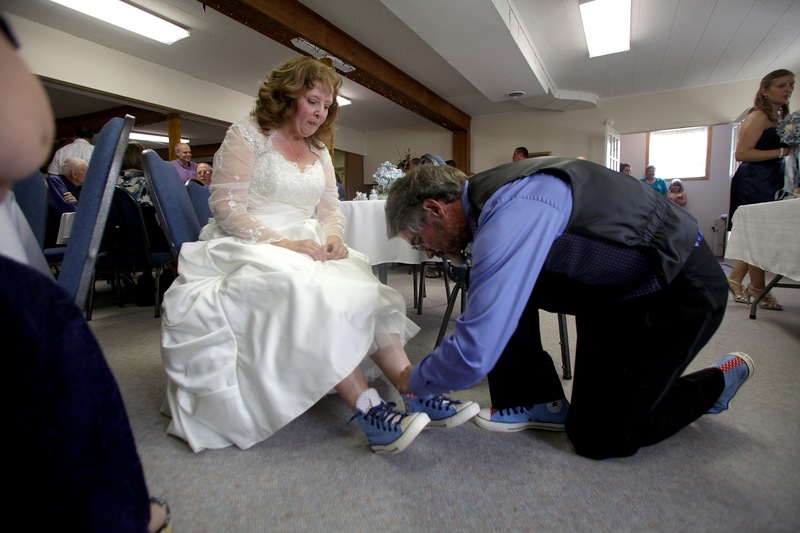 Those shoes must have some magic in them, Mom and Dad were married for 47 years and blessed with a great relationship. Jeff and I are looking forward to many wonderful years together. Mom walked me through my wedding ceremony. I wore the same shoes she wore at her wedding. We showed them off at the start of our wedding ceremony, so that all our family and friends would know I was walking in her shoes.